Long distance trains are travelling at potentially dangerous speeds. However, I have never encountered seat belts, airbags or similar on trains at least in Central Europe, even though this is common for cars and to some extent airplanes as well, according to official regulations. Why are such measures not installed on trains? Is there a specific (historical, scientific, economic, political) reason for this? Are there countries where this is handled differently? This Wikipedia article is a good place to start. Road, train and air travel have very different safety considerations. Crashes are significantly more likely in car travel than train and air travel. Also, seat belts prevent injuries during sudden deceleration, which is extremely rare during train travel. Plane crashes are even less likely than train crashes, but seat belts in aircraft are also designed to reduce injuries during turbulence, a comparatively common occurrence. So while train crashes are rare, surely it couldn't hurt to add seat belts? In fact, train seats are currently designed on the assumption that passengers are unrestrained, so they are intended to absorb the energy of impact during a crash. Modifying seating to add seat belts would increase the likelihood of injury for unrestrained passengers, since the seats would have to be made more rigid. Compliance on trains is likely to be low, since passengers will (correctly) perceive that there is little benefit to wearing a seat belt. Also, in the event of a crash, some passengers receive lesser injuries by being "thrown clear". Research finds that there is no safety benefit to adding seat belts (this is a summary of the citation "Assessment of Three-point Passenger Restraints (seatbelts) Fitted to Seats on Rail Vehicles" in the linked Wikipedia article). Because not speed itself, but sudden deceleration causes injuries. The idea of seat belts in cars is clear: A collision occurs, both participants experience a strong jerk and possibly intruding material from the other vehicle causing injuries. Even then you will notice that trucks and heavy cars fare much better in collisions, experiencing only mild jerks while the smaller vehicle is almost completely destroyed. The reason is mass, a truck with 10 times the weight of a car will only experience 1/10th of the accleration the car experiences! They hold the passengers so that their head does not collide with the ceiling in turbulence. They hold back the passengers in emergency landings when the plane is strongly decelerated by ground/water. Now locomotives are extremely heavy, weighing about 100 metric ton(ne)s. There is simply no vehicle which can cause a sudden dangerous deceleration apart, only a very heavy object like a tree/another train or derailing. Even heavy trucks stand no chance against a locomotive. There have been several instances where hitting a car wasn't even noticed by the passengers until the braking was applied. The mass advantage for vehicle collisions is serious. This leaves us with uprooted trees/other heavy objects and derailings. Railways are normally cleared of trees in immediate vicinity and the train driver would notice them because he has normally a free view on the rails, so only unlucky and rare circumstances (Tree came badly down, bad sight, rail curves etc. etc.) cause an accident where the driver could not stop or at least decrease the velocity. Derailings are very rare and so unpredictable that it simply does not make any sense to use seatbelts because you will never need to use them 99.999% of the time sitting in a train. ADDITION: phoog added correctly that another train will have enough mass to cause a severe collision. In fact most deaths are caused by frontal colliding trains. Another one I overlooked are medium excavators which are heavy and sturdy enough to cause serious damage and deaths. Trains are a very safe way of travelling. By the time seatbelts became popular in road vehicles, etc., trains had already reached sufficient levels of safety for it to be seen not to be worth it. I think this is the main reason. Cars crash much more often than trains, and planes have turbulence. Trains don't suffer from these issues. Trains (even long distance trains in many countries) have capacity for standing passengers. Seatbelts wouldn't help them. Trains, and yes, sometimes even longer distance trains, sometimes rely upon having short dwell times at stations. Having to unfasten your seatbelt to alight or to let others into a window seat would add to dwell time. When you only have a minute or two (or even thirty seconds), this can be very significant. Look at medium-distance journeys combined with dense commuter routes, like Thameslink in the UK, for examples of where everything was done to reduce dwell time. Also compare with urban buses, for instance, which also don't usually have seatbelts. One of the main ways that seatbelts in cars save lives is by preventing ejection from the vehicle. Trains nowadays are designed to prevent ejection through other means, like ensuring as much as possible that the vehicle will maintain its integrity, that windows are sufficiently strong to withstand impacts, that seats (especially airline-style ones) will help to contain passengers, etc. Other answerers pointed out that belts on seats are unfair for standing passengers which can't use them. Let me explain why trains are intrinsically infinitely safer than road vehicles and airplanes. Train safety is a full branch of rail engineering, and is obviously different from road, air and sea safety. First, note on airplanes: seat belts are not mainly there to save people from full-force crashes (beacause air to ground impacts on full weight are fatal) but mainly to help protect them from turbulence or sudden deceleration during canceled takeoff and landing. Airlines don't want you to hit your head with your front passenger's seat during these events, because insurances don't like to pay damage. Trains move on a single dimension as they have no ability to steer, so handling their safety is easier than roads. Front impacts and derailments are the only kinds of accidents that rarely occur. Train crashes are incredibly rare for infrastructural reasons: safe distance is technically enforced by signaling systems. Road vehicles are not compelled to respect a safe distance (for instance, buses in EU do have seat belts and bus crashes do happen on roads), which is also estimated according to travel speed (150km/h - 95mph of max speed for example). Unsafe distance is not simply one of the main crash reason of road vehicles, but also causes the effective crash to happen at faster speed. At equal speeds and driver's reaction time, of the two cars which suddenly brake the one with longer safe distance will crash at a slower speed than the one tailgating. And tailgating is also a very common phenomena on our roads. We need belts on road vehicles. Trains are much different in this regard. Consider a 11-cars train launched at 300km/h (220mph?). Not only iron wheels provide a fraction of the grip of tyres on asphalt, the mass of that convoy is infinitely larger than a truck. Train regulation authorities take this into account and do enforce safe distances by designing rail infrastructure over the concept of blocks. 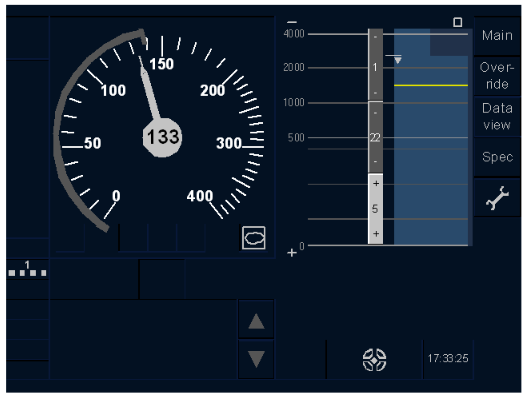 SNCF (no direct link available as I used other source) estimates a TGV at 300kmh needs 3300m to stop on emergency brake, so the train is reserved always more than 3300m front where no other stock is guaranteed to circulate. How is that actually enforced? There is no rail police pulling up trains driving too fast or to close to the other but simply the line is electronically controlled so that blocks of predefined size (I recall 1200m for regular traffic 200kmh/130mph and 5400m for high speed over ETCS, see later) are "held" by the train tripping electronic switches. 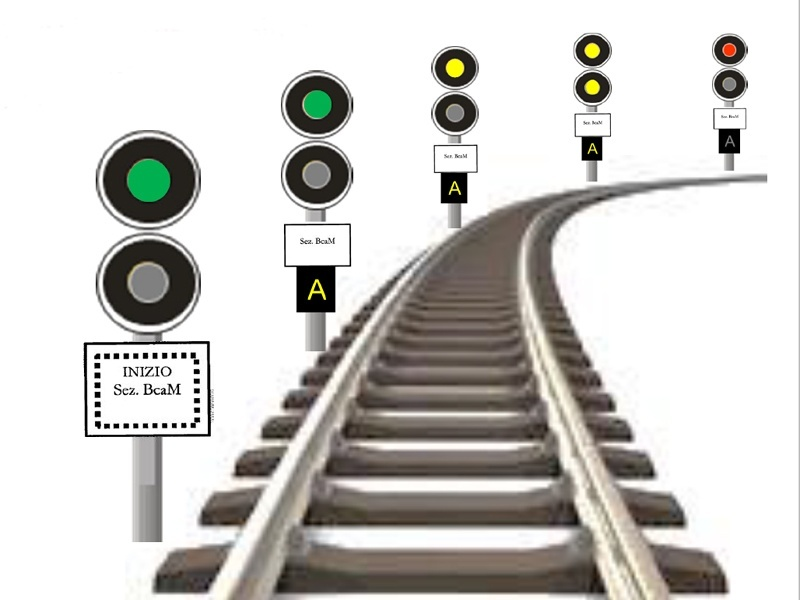 In the above diagram, each traffic light is separated by block_length_here of rails. When a train enters a block, its preceeding light turns red and one (2x block), two (3x block) or more (3+x block) change colour according to regulation. Generally speaking, trains are allowed to drive green at max speed, are required to slow on yellow and must absolutely not enter a red because another train is physically driving in that block_lenght_here space. I have replaced figures with block_length_here for generality. The above is a general concept and each regulator defines the number of states and effective colours. E.g. a metro service may use only red/green code, or decide to close two blocks rear of the train. Also, all trains on modern lines are required to equip safety devices that enforce emergency brake as soon as the train passes a red, or yellow too fast. You can find the above in all modern lines around the world, but consider that the effective signal (circle, square, double-yellow, etc) vary by country, especially in Europe in which each country has its own rail signaling system. But the very concept applies to all. It is also interesting to note that trains are also designed themselves to minimize fatal damage in case of front crashes and derailments. On front crashes, the driver is normally the first victim and hopefully the only casualty, because the majority of trains (I would take Sweden and Denmark immediately out from this list because all their rolling stock have distributed engine power) are pulled by a front engine car, which absorbs a large part of the impact. Note that the force of impact is not equally distributed to through the length of convoy, but is puposefully designed to dissipate through the front parts. I am simply saying that passengers seating/standing on the middle of the train will be shocked by the deceleration but very unlikely at a fatal force. About derailments, trains are also designed to limit the number of derailed cars. Consider for example Alstom's AGV trains (slide #20) that feature engine-and-coupler-wheels between two carriages: the manufacturer stated that this design technique, while increasing maintenance costs by not allowing to decouple a car on the rail, allows to consisently recuce the likelihood of a derailed car to flip on its axis. 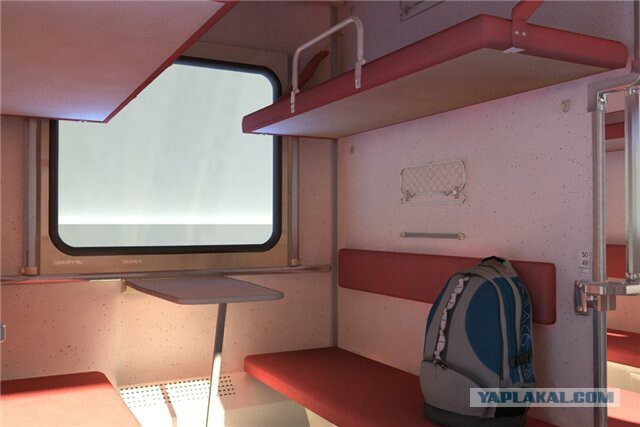 Train interiors do also have design features to limit the damage to passenger. While a passenger caught by an impact during his way to the toilet will still fall and hit his head on something hard, seated passengers may be (partially) protected by the seat in front of them and/or the table before the reverse seat in front of them. Pick Shinkansen, where every seat always fronts the train's travel direction. Seats are never rigid but allow jostling not only to inclinate them (for traveler's comfort), but also to absorb the impact. Trains, unlike cars and aircraft, were designed for longer travel, in terms of both distance and time. Cars have no provision for the passengers to get up while moving, they remain seated while the vehicle is in motion. On a plane, you are served everything at your seat. You are expected to remain seated except when you need to use the toilet. While traveling in a train on a "journey," it's not only difficult but even harmful to sit through the entire duration. You may move about a bit and probably lie down even. That way, seat belts are a natural on cars and planes but not in a train. 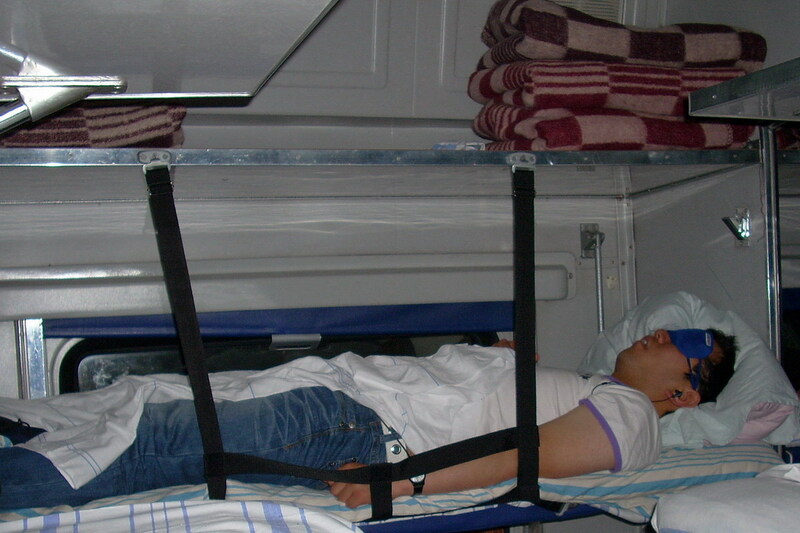 In Russian Railways a passenger on upper sleep place can take a safety belt from a porter. Such belt is used at noncurrent carriages, modern ones have turnable barrier. This can prevent falling down accidentally or in case of emergency brake. Are trains unsafe in Asia/SE Asia?